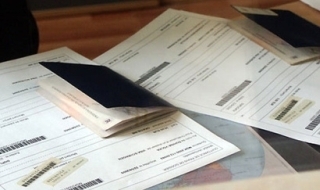 Police broke down an alleged ring in Macedonia involved in making fake documents including passports, ID cards, driving licenses and other personal items for clients in Western Europe. Macedonia‘s Interior Minister Gordana Jankulovska said five people have been detained in a joint clampdown by Macedonian and German police on the alleged ring while eight other suspected members of the criminal group were still at large. She said police confiscated 48 Italian, Dutch, Belgian, Bulgarian, Greek, Slovenian and Finnish passports, ID cards, driving licenses, document-making equipment as well as money. The gang which also involved travel agencies sent fake documents to Germany for distribution to other countries.